S.A.F.E. Archery® equipment is designed to be enjoyed by players of all ages and skill levels, anytime, anywhere. The following guidelines should be followed for the equipment to remain safe and enjoyable for all. Adult supervision is required at all times. Never leave the Hoverball® Archery Target unattended. Participants and workers should always wear eye protection. Never dry-fire a bow. Dry-firing (pulling back and releasing the bow string without an arrow) creates significant stress on the bow limbs which effects equipment life cycle. Participants must shoot 15 feet (4.6 M) from the Hoverball® Archery Target. Proper distance should be marked by tape, cones or table. 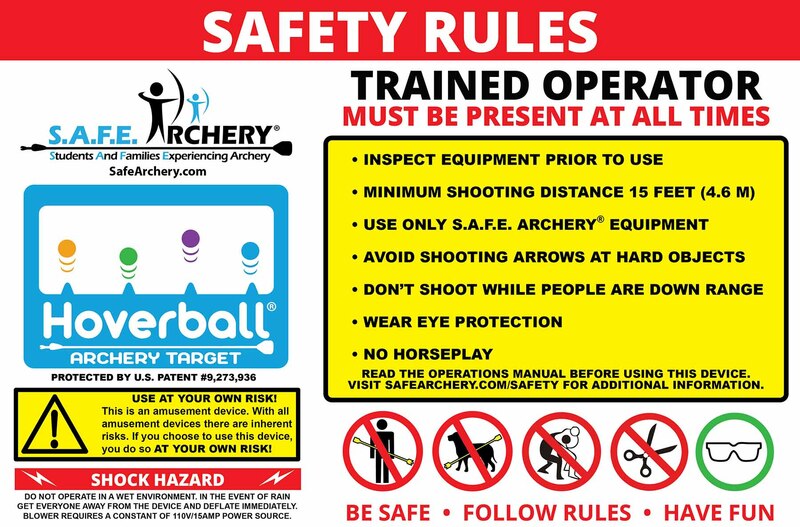 Do not shoot when anyone is in front of the Hoverball® Archery Target. When a worker is retrieving arrows or resetting the floating balls, all bows should be laying on the table or ground to prevent accidental firing. Do not rest the bow on a table when shooting. The bow limb will likely hit the table, effecting shot accuracy and could damage the bow. The Hoverball® Archery Target should not be operated outdoors if winds exceed 15 MPH, in rain, or when lightning is present. Please read the Hoverball® Operations Manual for more information.